How is basic education funding distributed? How is BEF distributed? 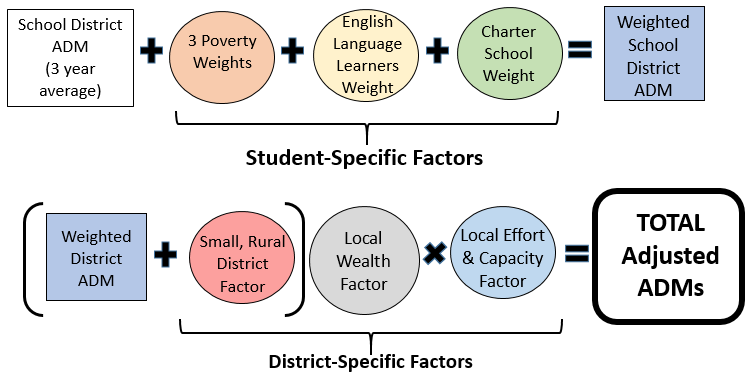 With $6 billion in the BEF line item, how it gets distributed to school districts matters. The BEF line item has had a long and varied history of distribution methodologies—some of which included consistent formulas with factors for items such economic disadvantage, school district wealth and tax effort; others were based on the annual politics of the legislature and a changing list of prioritized factors. The varied and inconsistent distribution of BEF over the past several decades led to the creation of the Basic Education Funding Commission in 2013. The Commission, made up primarily of legislators from both chambers and parties, worked to develop a new BEF formula to provide more consistency in the date elements used to distribute the funding, to focus on the factors that increase the cost of providing education and to remove politics from the process. The Commission recommended a new formula that has been used to distribute BEF since 2015-16. This new BEF formula includes several factors—both student and district focused—to distribute BEF funding. This formula is summarized in the graphic below. Over the next several days, we'll walk through the mechanics and dynamics of the components of this critical funding formula.